This is a surname of ancient Welsh-Gaelic pre 10th Century origins, which by centuries of dialectal usage has gradually adopted a "modern" form. It derives from the personal name "Hwfa" (pronounced "Hova"), which is believed to be a nickname translating as "the Owl". This bird was associated with wisdom, and this is not inappropriate as at least one Archdruid carried the name. The first recording, although not as a surname, is probably that of Houa ap David (Hova, son of David) in 1292 (Powys), whilst in Caernafon in 1293, is recorded Ythel ab Houa, "ab and ap" having the same meaning as the Scottish Mac or Mc, "son of-". 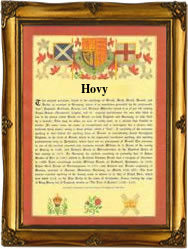 The surname developed in two forms, the more usual being to ap-Hova, now Povey or ap Hova, to the rare Hovey. The name recordings include: John Hovey (also spelt Hovy) of St. Botolph's with Aldgate, London, and Raphe Hovie, son of Raphe Hovee (see below), who was christened at Repton, in 1617. The first recorded spelling of the family name is shown to be that of Raphe Hovee, which was dated August 22nd 1580, christened at Repton, Derbyshire, during the reign of Queen Elizabeth 1, known as "Good Queen Bess", 1558 - 1603. Surnames became necessary when governments introduced personal taxation. In England this was known as Poll Tax. Throughout the centuries, surnames in every country have continued to "develop" often leading to astonishing variants of the original spelling.